I love exotic flavors and this soup has it. It is incredibly simple. Super quick and will be a staple in my p2 for sure. Just add a nice salad on the side and it is a light but filling meal. Let the meatball mixture sit over night for best flavor. Use whatever phase appropriate meat you want. I am anxious to get my hands on some ground lamb for the next batch. Chicken and turkey would work, or a combo of them. 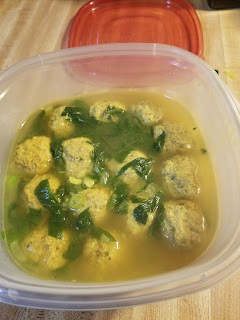 The meatballs are delicious and a great protein snack without the soup. Use a food processor to mix the meatball mixture. You want it to me a paste like texture. In a food processor add the garlic, onion and mint, and pulse until finely ground. Add ground meat, spices, salt and olive oil (for p3 only) and process, scraping down sides several times, until mix is a paste like consistency. Place in the fridge for 15-20 minutes or overnight. In a large pot, sauté onion in olive oil over medium heat, stirring until tender and translucent, about 5-6 minutes. Turn heat to medium low, add garlic and sauté 2-3 minutes. Add turmeric and some black pepper , sauté 2 more minutes. Add chicken stock and bring to a boil. Turn heat down and simmer gently for 10 minutes. Salt to taste. 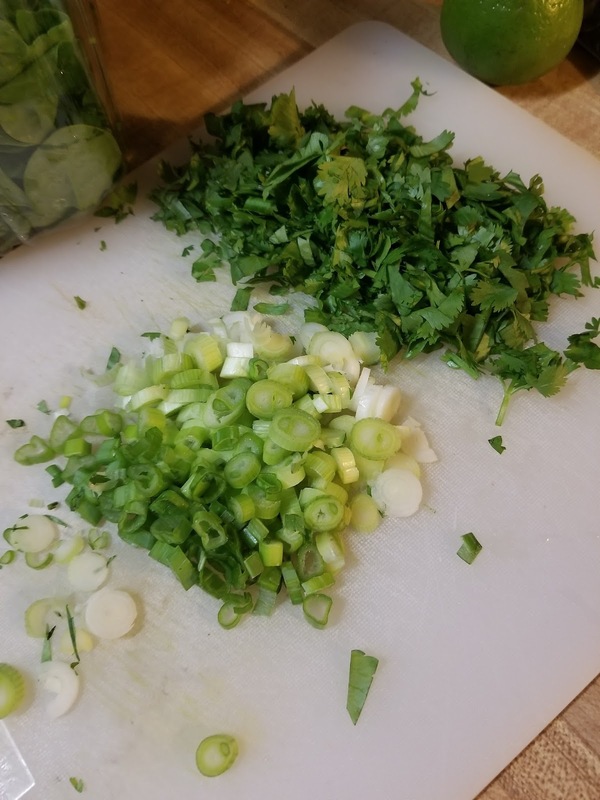 Chop spinach, cilantro and scallions. Divide meat mixture into 4 equal balls, then each ball in half, and then half again, until you have 32 equal portions. Using wet hands, roll the meatballs and place on a plate. 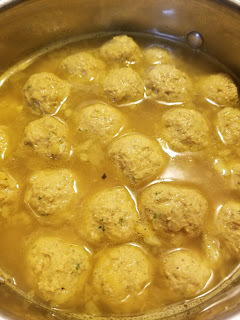 Bring broth back to a vigorous boil and gently drop meatballs into the pot, a few at a time, stirring gently. Turn heat down so soup is simmering gently. Simmer 10 minutes, stirring once or twice, and skimming any impurities that rise to the surface. Meatballs will start to rise when done. After 10 minutes, add the spinach and cook for 2 minutes ( a little longer for kale). Add ½ of the scallions and ½ the cilantro and squeeze the lime. Taste for salt and acid. You really want to be able to taste the lime juice a bit. Adjust seasoning if needed. Garnish with fresh cilantro and scallions. Broth is unlimited, each meatball is 1/2 oz. so serve as many as you need for your snack or meal portion. I think so. I don't freeze many things. Most delicious P2 meal I've had in both my 4 week cycles! Thank you. Out of curiosity, do you add additional vegetable to this meal? If so, how much and what types? I was "dying" on the Phase 2, mostly because of struggling with the breakfasts. But, this soup is absolutely amazing. I added all the cilantro and scallions at once. I plan to freeze 2 servings for next week so I have something to clearly look forward to. Thanks! My dinner tonight and it's delicious! Just made this tonight and it is incredible! Great recipe, and it freezes well. I added all of the veggies at once as someone else mentioned, and it was fine. This soup is absolutely outstanding, Carolyn, thanks so much for sharing it and all your other wonderful FMD recipes. It makes staying on program so much more doable and delicious!